Gaming Olympic is a technical companion to X-Day: Japan. 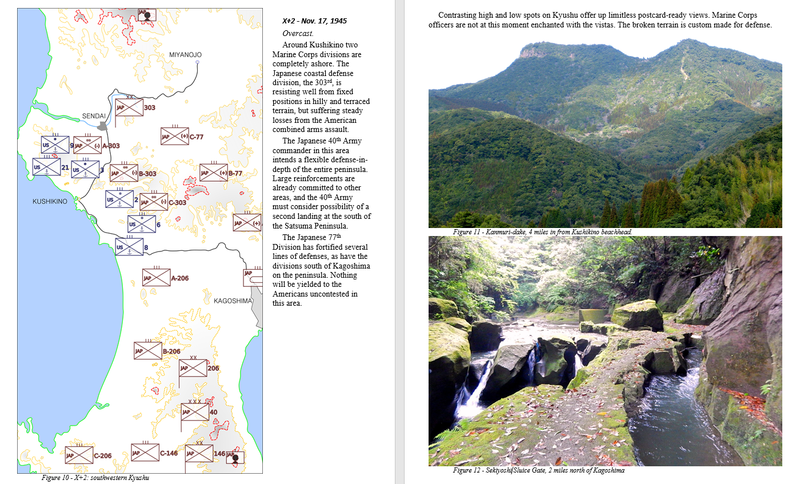 More information about the book can be found at the X-Day: Japan project site. Set for November, 1945, Operation Olympic was the first half of Operation Downfall, the American plan to invade Japan and seize Tokyo in 1945-46. In support of the journalistic novel X-Day: Japan, Operation Olympic was gamed out over contemporary Army maps. In this book the greatest amphibious invasion in history is played out day-by-day. American and Japanese forces meet, fight, and suffer over several months of conflict. Running commentary describes the difficult decisions faced by field commanders on a regular basis, and the impact of each decision on the brutal fighting. Other books have covered the invasion plans, but no modern works are supported by this type of effort. X-Day: Japan ended with a broad tactical nuclear attack, using the early low-yield weapons available. Impact of such weapons on a large battle front is displayed and evaluated.